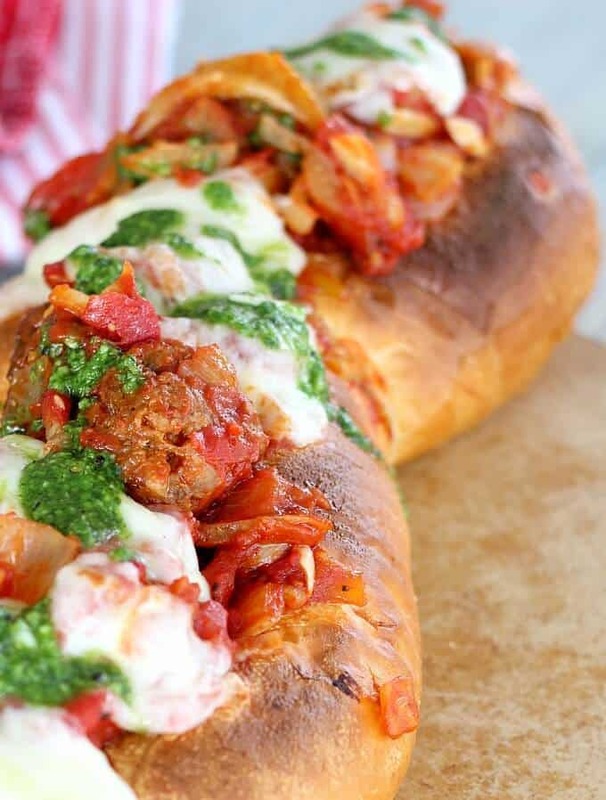 Get ready because this might be the best meatball sandwich ever. At least the best my family’s ever had, for reasons I’m about to share. Plus the best because the first time I made it, people were actually fighting for the last bite. 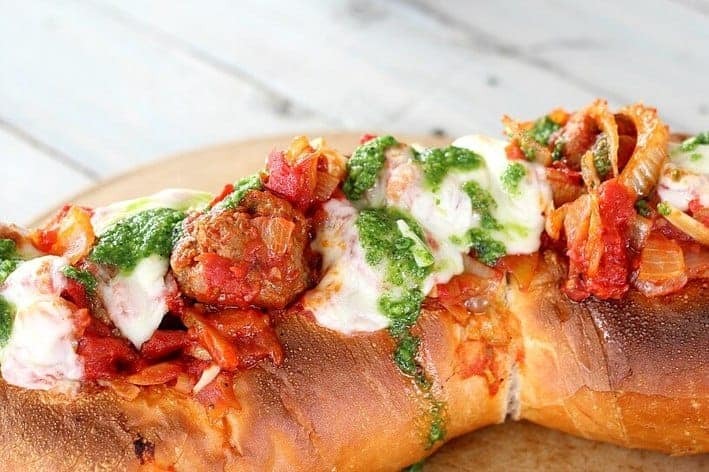 A couple of factors are critical for a meatball sandwich to be called The Best. First, you need to use good quality sausage meat. Besides searching out the freshest sausage, made locally, I found that using more than one variety was key. In this recipe I made half of the meatballs out of hot Italian sausage and half out of Bratwurst. This mix made the flavors that much more complex and successful. Second (and duh), the sauce needs to be incredible and this sauce is just that. These simple ingredients remind me of my favorite Italian sauce recipe by legendary Marcella Hazan. The sauce is only tomatoes, onions and sliced fennel plus a little garlic. 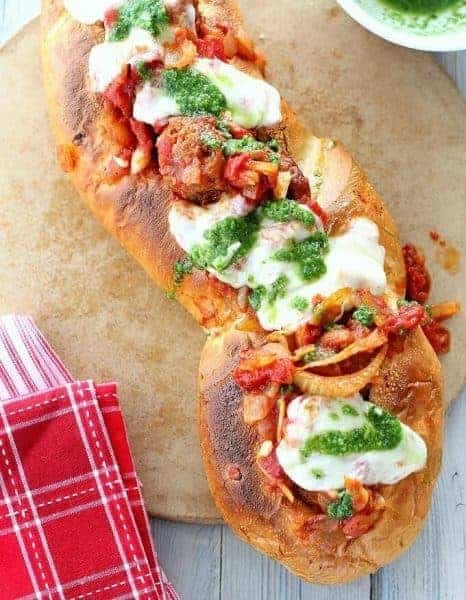 It’s perfect with the meatballs in this sandwich. Perfect. After the meatballs have been browned just enough to flavor the pot, they get set aside. Then fragrant slices of onion, fennel and fresh garlic are sautéed (don’t worry, the fennel will not overpower at all). Once everything just starts to caramelize, add tomatoes, crushing them as you go; simmer a bit and then add the meatballs back in to finish cooking through. If using a loaf of French bread, which I highly recommend if you’re feeding a crowd, hollow out the top as I’ve shown you. For the basil paste, process basil, garlic and olive oil in the food processor and then brush about half the basil mixture into the opening of the bread. If using hoagie buns, make sure the buns are sliced ALMOST through, and brush the basil on the cut side. The bread gets a few quick minutes under the broiler to toast up and deepen the basil and garlic on the bread. After that, spoon the meatballs and sauce onto the bread, layer mozzarella cheese and broil again. Serve with the rest of the basil paste spooned over the top. Not only is this a pretty presentation, it’s so hearty and flavorful… looking here I don’t think you need any more convincing. This is a versatile recipe. Make the meatballs and eat with toothpicks or over pasta. 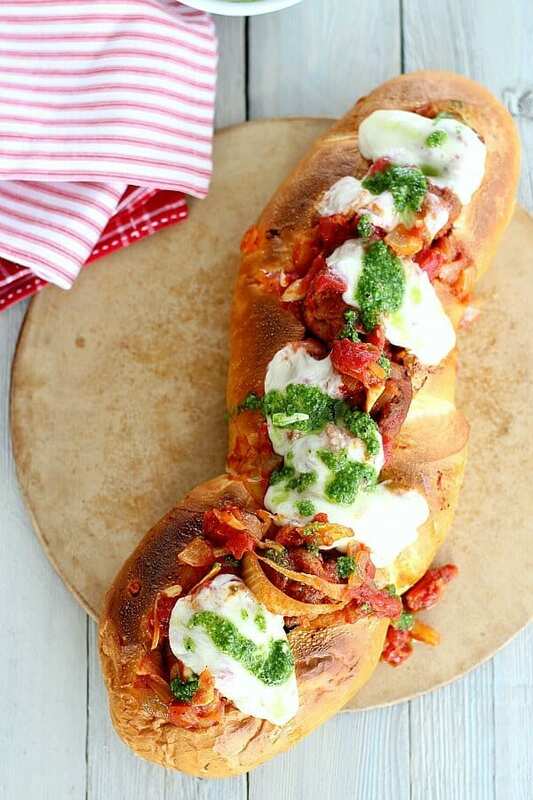 Shown here in a large loaf of French bread, it's perfect for a party. Or make individual hoagie sandwiches. Use good quality sausage and feel free to use a couple different types of sausage. We prefer a combination of hot Italian sausage and bratwurst. If using a combination of different sausages (Hot, sweet, Italian, Brats, etc), do NOT combine them into one mix for the meatballs. It adds to the great flavor for the meatballs to be different. Using wet hands, lightly roll sausage into 12 golf ball-size balls (about 2 oz. each). Heat 2 tablespoons of the oil in a large Dutch oven or other heavy pot over medium heat. Cook meatballs, turning occasionally, until just browned all over on outside, 6-8 minutes. Transfer to a plate. In same pot (do not clean out the pan) add 2 more tablespoons oil, add fennel, onion and HALF of the garlic, season with salt and pepper and cook, stirring often, until onion is translucent and golden brown around edges, 8-10 minutes. Add the tomatoes, crushing them with your hands as you go, and bring to a simmer. Season with more salt and pepper and cook, stirring occasionally, until sauce just begins to thicken, about 5 minutes. 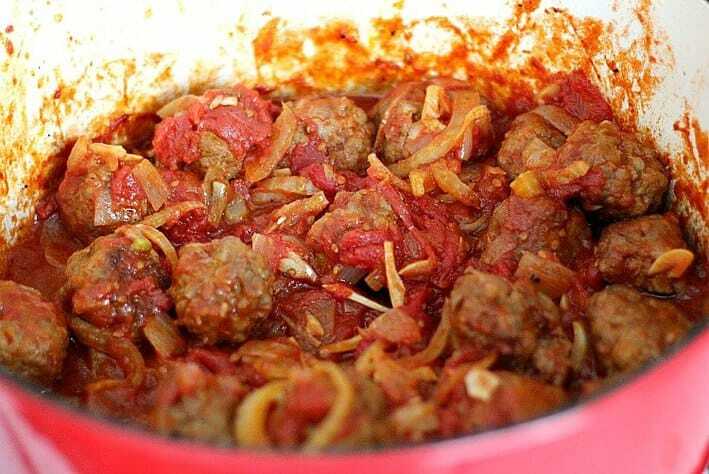 Return meatballs to pot, bring to a simmer, and cook, stirring occasionally, until sauce is reduced by half and meatballs are coated and cooked through, 15-20 minutes. Meanwhile, heat broiler. Process fresh basil, remaining garlic, and remaining 4 tablespoons oil in a food processor to a smooth paste; season with salt and pepper. If making the sub out of a large French loaf, cut a "boat" out of the top of the loaf, being careful not to cut through the bottom. Hollow out the inside of the cut at least half way down. Smear half of the basil paste into the opening of the loaf of bread. If using hoagie buns, smear over cut side of rolls. Place on a rimmed baking sheet. Broil rolls or loaf just until golden brown, about 2 minutes. 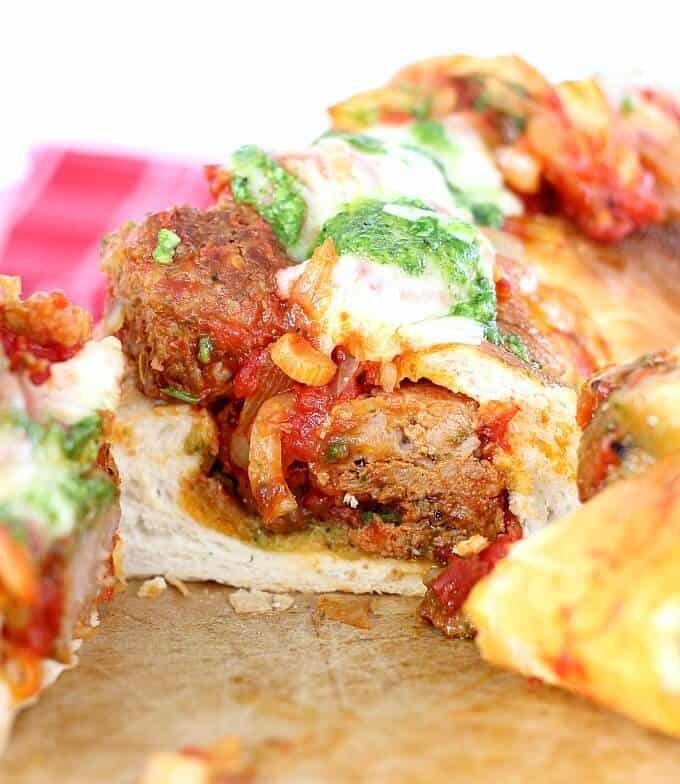 Place meatballs inside hollow of loaf or inside rolls, then top with sauce and mozzarella. Roil until mozzarella is melted and bubbling, about 5 minutes (watch carefully). Spoon remaining basil mixture over sandwiches. 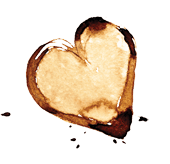 For French loaf, cut into individual slices, about 2" thick just before serving. Recipe adapted from Bon appetit magazine, February 2016. This looks insane, Sally! I love it! Sally THIS. IS. FANTASTIC! I’m drooling just looking at it and man, I wish I could have this for dinner 😀 I love that you use Fennel in the sauce… I absolutely LOVE eating Fennel (eventhough I absolutely hate licorice! )and might even use my favourite Fennel and Pork sausages for the meatballs. Pinning! Hi Dini, LOL, my girlfriend who sampled this for me just called me telling me she’s making only the meatballs for the Super Bowl. I am with you, I don’t like licorice but this fennel was superb. Thanks for stopping by and have a great weekend. Oh, yum! I love this idea and can see why everyone fights over the last serving. I’m glad you mentioned fennel and that it works well in the sauce. I’ve only tried it raw and never thought about cooking with it. Pinning!